WASHINGTON, DC, July 16, 2013 (ENS) – Heat waves and drought conditions are touching off wildfires, shriveling grasslands across the western states and stressing eastern urban residents, forcing lawmakers and public lands managers alike to rethink their approach to water supplies. In Washington, the Senate Water and Power Subcommittee is holding a hearing today on the future of the Colorado River. 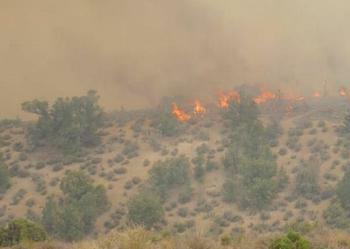 The hearing follows recent deadly wildfires, a record-breaking heat wave and worsening drought conditions in the Southwest that have put the region’s residents, wildlife and natural resources at risk. The subcommittee is examining the Bureau of Reclamation’s Colorado River Basin Water Demand and Supply study, released last December, which found that there is not enough water in the Colorado River to meet the basin’s current water demands or future demand increases. Spanning parts of Arizona, California, Colorado, New Mexico, Nevada, Utah, and Wyoming, the Colorado River Basin is one of the most critical sources of water in the West. The Colorado River and its tributaries provide water to nearly 40 million people for municipal use, supply water used to irrigate nearly 5.5 million acres of land, and is also the lifeblood for at least 22 federally recognized tribes, seven National Wildlife Refuges, four National Recreation Areas, and 11 National Parks. Climate change will reduce water available from the Colorado River by nine percent, increasing the risk to cities, farms and the environment, the study concludes. Across the country, more than 40 percent of U.S. freshwater withdrawals are used for power plant cooling. These plants also lose several billion gallons of freshwater every day through evaporation. New research released today by the Union of Concerned Scientists indicates that increasing demand and drought are putting a great strain on water resources. Low water levels and high water temperatures can cause power plants to cut their electricity output in order to avoid overheating or harming local water bodies. A pathway that includes strong investments in renewables and energy efficiency, according to the UCS study, would greatly reduce power generation’s water use and carbon emissions. Under such a scenario, water withdrawals would drop by 97 percent from current levels by 2050, with most of that drop within the next 20 years. Meanwhile, hot, dry conditions persist west of the Mississippi River, with at least 15 states experiencing drought. Drought conditions are taking a toll on western rangelands, leaving little water and forage for animals and livestock, prompting the Bureau of Land Management to provide supplemental water and food for wild horses, reduce grazing, and enact fire restrictions. In New Mexico, 93 percent of rangeland and pastures are rated poor or very poor. The figure is 59 percent in Colorado; 35 percent in Wyoming; and 17 percent in Utah. Similar conditions exist in Nevada, where more than 60 percent of the state has been in severe or extreme drought conditions since the beginning of 2013. “Since last fall and winter, we have been working with grazers across the West in anticipation of tough conditions related to drought. In southwestern Montana, for example, the BLM worked with permitted ranchers to graze no more than 70 percent of their alloted forage on BLM-managed lands,” said BLM Principal Deputy Director Neil Kornze. 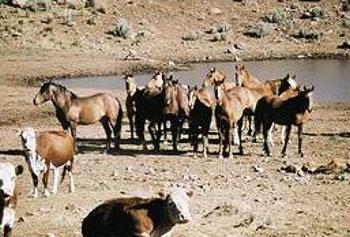 In Nevada, all BLM Districts have been hauling water to wild horses. There, the BLM is trucking 5,000 gallons of water per day, five days a week to four locations in the Winnemucca District at a cost of $1,000 a day. In the next few days, a USDA Animal and Plant Health Inspection Service veterinarian will join BLM specialists in assessing horses in Lincoln County, Nev., after BLM employees noted that horses were not drinking water from trucked-in troughs and were not eating supplemental hay. This raised concerns about the health of the animals. Over the past week in Nevada, average temperatures have been 10 degrees above normal, hovering around 100 degrees. The state has recently had only 0.1 to 0.5 inches of rain, resulting in sparse, poor-quality forage, according to the BLM. Scarce water sources have put pressure on all users, including wild horses, livestock, and wildlife; causing long-lasting damage to plants, stream channels, spring areas, and water quality. The heat wave continues across the eastern United States, with highs Tuesday expected to reach the 90s across much of the eastern third of the country, says the National Weather Service. Combined with humidity, this will create heat index values of 100 degrees Fahrenheit or higher. In New York, Con Edison’s crews, working 12-hour shifts, are pulling cables, replacing fuses and other equipment to bring power back to customers as the heat wave blankets the metropolitan area. The heat wave is expected to extend into Saturday. Crews have been responding to scattered outages and have restored power to more than 7,600 customers in New York City and Westchester County since the heat settled here on Sunday. New York City Council Speaker Christine Quinn called New York City Police Commissioner Ray Kelly personally after an intern fainted in the heat and paramedics did not arrive for more than 30 minutes. Across the Great Plains, AccuWeather.com Expert Senior Meteorologist Alex Sosnowski and Head of AccuWeather.com’s Long-Range Forecasting Team Paul Pastelok, say heat will be coming in and out of the Plains over the next 30 days. For the next two weeks, the Midwest will have temperatures in the 80s and 90s. Meanwhile, temperatures will remain below normal across parts of the southern and southwestern states, mainly from Texas to Arizona, where heavy rain and flash flooding are possible. The Southwest will catch a break as building monsoon conditions ease the heat down for the Four Corners area, but temperatures will increase over the Great Basin and West, according to AccuWeather forecasters. All this week, the odds favor above-median precipitation over western Alaska, the southern Rockies, the Northern Great Plains, Western and Central Gulf Coasts, and from the Great Lakes to the Mid-Atlantic, according to the U.S. Drought Monitor, a service of the federal government. Dry conditions are likely across the Pacific Northwest, eastern Alaska, and the Central Great Plains. Temperatures are likely to be above normal west of the continental divide, and from the Midwest to the Northeast, with below-normal temperatures favored over New Mexico and the Southeast. AccuWeather predicts the mercury will soar come September when the Southwest region will reach its hottest point of the year.